“I’d count myself lucky,” I said to her, or something like that. Was I snippy? Too harsh? I can’t remember, but I know there was a stiffness in me when I spoke, and I’m pretty sure I sounded critical. I was judging her because I couldn’t understand how having a mockingbird singing outside your window would be reason to lament, even in the middle of the night. “I’d count myself lucky,” I said. And I’ve been lucky in the last few weeks. There’s one who comes now to the electrical pole not far from the window by my bed. He sings from his perch there during the day, but it’s the late night hours I find the most enchanting. It reminds me of living in Santa Rosa years ago, not many months after I first learned who the mockingbird is. One would come to the tree outside my bedroom window and serenade our quiet neighborhood in the middle of the summer nights. It always felt like a dream, like magic, a holy visit. Now when I hear our Palm Springs mockingbird singing when the rest of the world is silent, that same sense of enchantment comes over me. I relish his song while I lie in bed, the way I savor the sound of raindrops on the roof, sometimes only half waking in the dark, like a lullaby, sending me deeper into dreams. The late night singing feeds me freesias and night-blooming jasmine, fresh sea air and moonlight on water. It feeds me stars and the night sky, the scent of moist dirt rising. Not once have I wanted to stop his singing, only to be able to keep listening, keep soaking it up like the dry earth soaks up rain. The mockingbird’s song is a dance, a celebration, an invitation to take wing. My heart soars with his cadence, and I slide back into sleep. I’m sorry now I didn’t post this here the very evening I heard Suzzanne’s message on my voicemail. It was after Laurie and I spent that day writing for over six hours. I’m convinced it’s all connected. 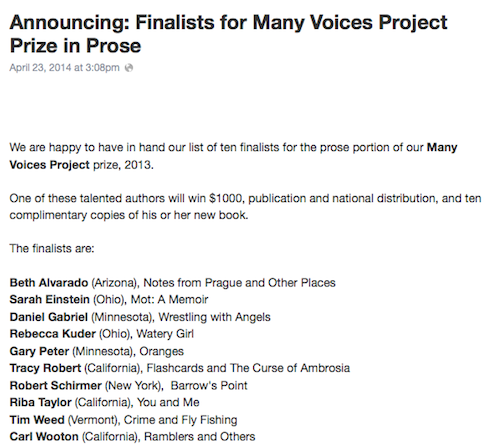 Listening to my messages, tired at the end of that intense day of writing, I found out my book manuscript, You and Me, has been selected as one of ten finalists for the Many Voices Project at New Rivers Press. It still feels like a dream. I didn’t post the news right away because Suzzanne thought they would be gathering photos of each finalist, making an announcement on their website. I waited to tell you about it because I wanted to be able to offer up the link to that page, make it all real. Now it makes me sad I didn’t share the news while it was still hot, still streaking through my veins, the joy and the thrill, the incredible validation, the almost overwhelming gratitude. I don’t know exactly how many entries there were. Maybe 300 or so, Suzzanne thought. And it looks now as though they may not get a chance to post us on their website before the winner is selected, which could be at the end of this month. (They are a university press, run by a small staff, so I understand this. It’s likely they are already accomplishing more than is humanly possible.) Still, I love that they let us know right away, let each of us savor being selected while every one of us still has a chance of winning. I think it is a great kindness. I pray to keep my joy about this, to hold fast to my gratitude and to the deep validation in it no matter how things unfold. If my manuscript wins, I will rejoice like nobody’s business, leaping tall buildings in a single bound. And this time I promise I’ll tell you right away. I have an ailing cat. She keeps losing weight but on most days will still climb the fence to go exploring. My godmother has a beloved older dog who is undergoing one thing after another. She hurts her wrist and her shoulder grinding up Annie’s pills. She’s been through this before. My friend Audrey has a friend who may be heading into the last stretch of a long debilitating illness. She isn’t eating enough, so Audrey brings her to her home and cooks her an omelette. She thinks she’ll only eat a few bites, but her friend polishes off the whole thing. Another friend falls apart when one of her sisters calls to let her know their mother has broken her hip. It stirs everything up, sinister foreshadowing, the beginning of the end. I think the unknown is the hardest part. She feels the death of her parents looming, then makes the jump to the ailments and death of all her friends. “It all looks pretty bleak,” she says. Wait, I think later. Come back. We may have decades of healthy lives ahead of us. I buy organic liver cat food, and my Sofia licks the bowl clean. The next day she won’t touch it. I worry when she leaves the courtyard and doesn’t reappear for six hours. When she comes back in the late afternoon, I fall in a heap and cry, the sun spilling across me on the kitchen floor. We all know this, are on one side of the equation or the other. We’ve been through this before. Our hearts sink and soar. Our courage, our hope, ebb and flow. Life becomes moments. Savor the taste of the cheese omelette in our mouths. Thrill at the sight of the red glass bowl on the floor licked clean. Rejoice in watching your too-thin friend enjoying the breakfast you made her. Lick the last piece of liver off your paw. Bury again and again the part of you who wilts inside at the way the ribs show through the woman’s skin, the cat’s gray fur. Breathe. Lean into laughter when you can. Kiss them on the forehead every chance you get.